From late 1783 to 1786 the atmosphere was heavily polluted by volcanic activity in Iceland. This led to loss of lives and adverse health effects due to toxic gases and reduced crop yields; and widespread cooling of the climate across Europe. 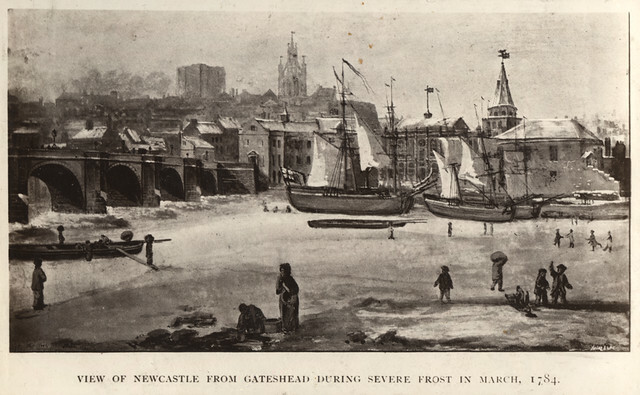 In Newcastle the Tyne froze over on 3 separate occasions between January and March 1784 - normally a very rare event. Since Christmas day, the frost has set in remarkably keen, attended with much snow, so that the river was frozen up on Tuesday. Many keels that morning stuck fast amongst the large bodies of ice, carried by the tide, and one, in particular, close to the Bridge, in a very dangerous situation; the men, however, were drawn up by ropes on to the Bridge. People were skaiting on the river on Wednesday, and a passage made very easy to Gateshead. Wednesday, in the market, the Butchers were unable to joint the meat, owing to the very intense frost, without having recourse to the ale-house fires in the neighbourhood. Very few of the country people attended the market, owing to the cold, and, in short, many circumstances concurred to make it be thought the most severe frost felt for many years. In April 2010, much smaller scale eruptions of the Eyjafjallajökull volcano in Iceland caused widespread disruption to air travel across Europe.